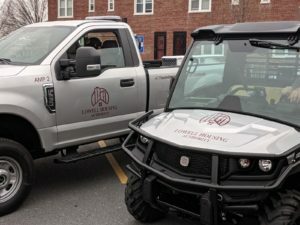 On a cold April morning, the LHA continued its re-branding efforts when the agency unveiled its new vehicle fleet, including 7 new trucks, and two utility vehicles. 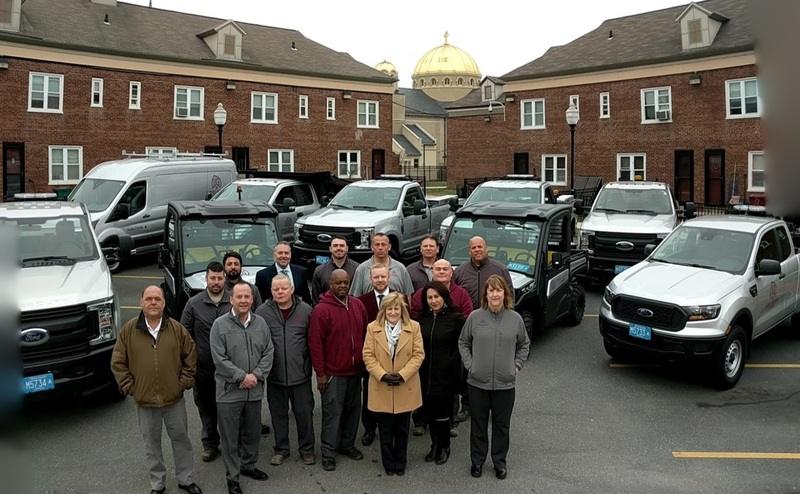 Staff members representing the agency’s maintenance team orchestrated a staging of the fleet on Dummer Street at the LHA’s North Common Village property. 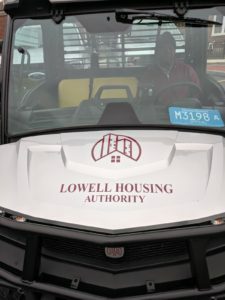 The process to replace aging maintenance vehicles began in 2017, which coincided with another priority to re-brand the LHA with a modern, color scheme and logo. The vehicles feature an ingot silver finish, identify maintenance work crews, and tout the agencies new slogan “A Foundation for Stability and Opportunity”. Beyond the aesthetics, an internal vehicle assessment conducted prior to purchasing, identified efficiencies that could be achieved when substituting utility vehicles for trucks at Highland Parkway and North Common Village. Utility vehicles, provide our LHA maintenance crews greater flexibility to plow, and maintain sidewalks and other tight spaces, preventing unnecessary and often costly damage to neatly manicured landscaping. Over the last two years, the agency has replaced 12 vehicles, and additional vehicles will be purchased in the future as the need arises. Thank you to the maintenance team and administrative staff who joined us. Thank you also to the residents who temporarily moved their vehicles to make this shoot possible! Click here to check out the LHA’s morning motorcade!